The Mining Area of the Great Copper Mountain in Falun is one of the most enduring and complete monuments of the world's industrial heritage. Mining for copper had been a local business since the mid-1200s, and lasted until the 20th century. 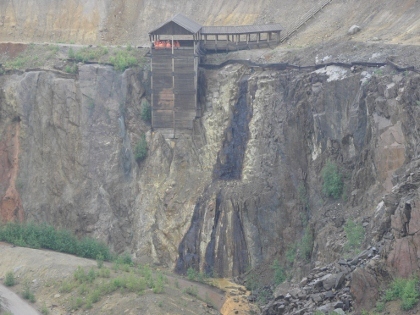 The core area is the historic mine at Falun with associated facilities above and below ground. The other areas contain many furnace sites, waterways, ponds, canals, and ancient mining settlements and the town of Falun with its 1646 gridiron street plan and wooden houses. There are so many mining landscapes on the List now, last week even 2 more were added. But I was still pleasantly surprised when I arrived at Falun. The big pit indeed is an impressive sight, although it is a totally ruined landscape of course. Sweden has a number of fairly underwhelming WHS, but I definitely rank Falun as the best Swedish site that I have visited so far. I did the full hike around the pit, where you can see it from different perspectives. 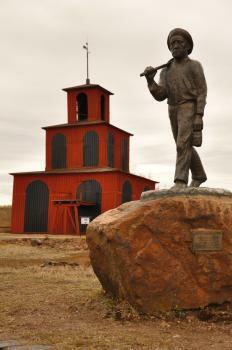 You also pass several very cute wooden red buildings, constructed for various uses during the mining periods. Unfortunately it started to rain when I was half-way, so I made a brisk walk back to the entrance. Near the entrance lies the big mining museum. A good place to hide from the rain of course, though I did not spent long inside. In my opinion it focuses too much on tools and other technicalities, and too little on the circumstances and stories of those that worked here or how the mine was run. But that could just be my preference for social history. In general Falun is a sight not to be missed when you're in Central Sweden. I visited this WHS in June 2018. 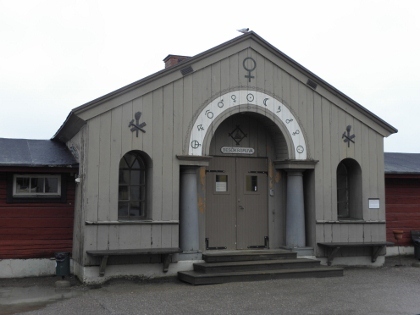 I slept over in Falun in the miners' neighborhood of Elsborg which allowed me to spend more time not only around the Great Copper Mountain, Kopparberget, but also at the inscribed components around the wooden town of Falun. 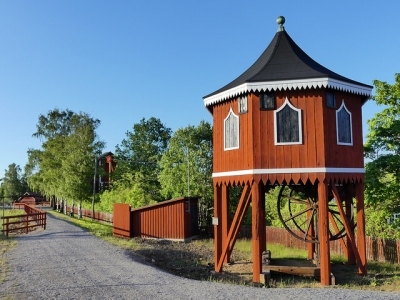 My favourite red falun wooden buildings were those housing the waterwheels, the large 'three-tiered' one and the smaller one (photo). Incredibly enough, the former houses the highest bridge in Sweden (till 2012) at 208 metres above the Creutz shaft. To give you an idea of the enormous depth of this shaft, the Millau Viaduct in France at 270 metres is the highest in Europe! The Creutz water wheel was erected in 1845 and has a diameter of 15 metres. 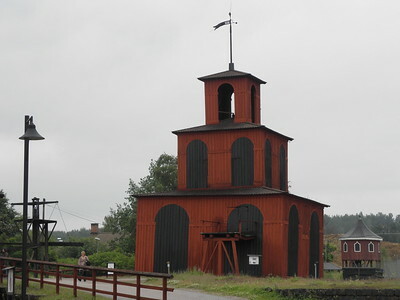 The Falun Mine is also part of the European Route of Industrial Heritage (ERIH). The slightly uphill hike round the circumference of the Great Pit and slag heaps is worthwhile with several information boards and peeking points. In summer, in the late afternoon and in the evening, birdwatchers should head straight to the viewing platform just opposite the visitor centre. From here, with a bit of luck and if you allow enough time, you should be able to spot a pair of one of the world's biggest and heaviest owls - the Eagle owls - which nest in the Great Pit and love resting on the two mining vehicles at the bottom of the pit. As Frederick states below, Falun gives you a real sense of how heavy industry can alter a landscape, and in comparison with nearby Engelsberg you can really get a sense of the huge industrial undertakings here. But there was something about this site that just failed to grab me. I had a walk around the smaller museum on site and to the viewing platforms and shaft head to look down into the mine, it was interesting enough but that was about all for me. The main point of interest was the Falu Rödfärg, it makes the famous Falu Red paint █ which is a by-product of the copper mining. If you have ever travelled in rural Sweden it is the colour that pretty much every building is painted. I will admit I didn't do this site full justice, having toured several mines and mining museums in the past I couldn't muster the enthusiasm for more of the same. So after looking down into the big pit we headed off through the nice looking city centre satisfied with our ticking off of a new site, but not massively enthused. We had actually visited an outlying part of the WHS quite by accident when we stumbled into Stora Hyttnäs Trädgård, a large miners house with a well planned garden, which showed that this site is larger than just the industrial remains in the city centre. We happened upon it whilst waiting for our tour to start at the excellent Larsson House. It was the home of artists Carl and Karin Larsson, and whilst it does display many of Carl's works its real charm for us was the interior design of Karin that has had a large influence on a lot of Scandinavian style that followed. For us this was the real highlight of the area so if you are in the area it is well worth heading to the house. Falun certainly shows the effect and influence that heavy industry can have on a landscape, and whilst it didn't really enthral me it was certainly a worthwhile visit. However for us it was two associated sites that I connected with more and could see their wider influence. The Falun Gruva is my favourite WHS in Sweden so far. The site can be visited all year round. After wandering around the pit I took a tour to the underground. There is a tour every day in winter (2 on weekends). Unfortunately mine was in Swedish, so I roughly understood about 10% of the guide's explanations. What you see can be compared to Rammelsberg, but the mine is better accessible with broad footpaths and save stairs. No problem for children and elder travellers. 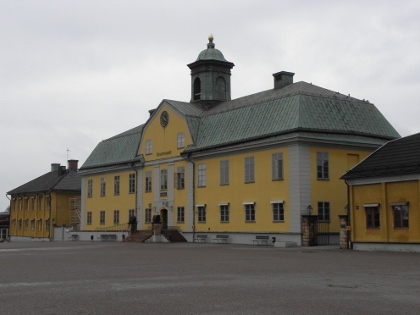 The WHS includes a few buildings in and around Falun. I visited the non-spectacular church and the village of Gamla Staberg, around 10km from Falun on the way to Engelsberg. The main feature of Gamla Staberg seems to be a huge garden, which wasn't really great as even in late March the country was still covered in snow. By car, Falun makes an easy daytrip from Stockholm. It can be combined with Engelsberg Ironworks. During my 2 weeks trip to Sweden and Finland, I saw two industrial World Heritage Sites, one is Ängelsberg Ironworks, and the other is the Great Copper Mountain in Falun. While Ängelsberg was so scenic with beautiful lake and forests, on the other hand, Falun really showed the result of heavy industry and pollution from copper mine. When my train approached the city of Falun, a part of inscribed area, I was surprised with the quietness of this city; there was no passenger apart of our group in the train station and nearby bus station! I took a bus to the Falun Mine; the bus route passed the city center which was quite pretty with some beautiful buildings and a lovely canal park. The bus took us to the rear entrance of the mine; the first view of the mine, which was the oldest mining company in the world since 1288, was the very big wooden figure of Kåre goat, a legendary goat that found the copper ore, in the large area of red devastated land with spoil tips, totally not a place for casual tourists. After many spoil tips and my friend’s white shoes become red-brown shoes, I finally saw the Great Pit, and this huge red pit was pretty amazing sight. 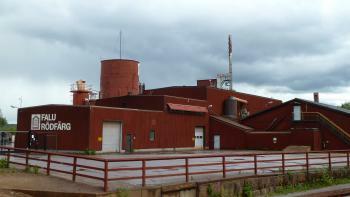 I walked along the rim of the Great Pit to see many mine’s wooden facility buildings painted in red color, or to exactly called Falun Red, a Swedish classic red color that found everywhere which originally made from Falun copper tailings. Unfortunately that we had to cancel our idea to see the underground mine, and decided to see the nearby Elsborg miners village instead. The village was quite lovely with many blocks of red wooden buildings. From Elsborg I walked back to the city center to have late lunch before take a train back to Stockholm. After visited Falun, mining area was not a place that I preferred to see as the ruined landscape really made me depressed, and I had to admit that I did not enjoy mining environment at all, if I have to revisit Falun, I better to explore Elsborg and beautiful lake nearly. Nevertheless, Falun was a good place to see the source of Swedish prosperity; it is not beautiful or attractive, but interesting and its local sausage is quite good. Falun is mostly famous for its copper production, once the most important in Europe and the source of Sweden's wealth and power in the 15th to 18th centuries. Today, production has ceased, and the remains of the mining operations make up one of the country's top attractions. The complex of the Great Copper Mountain makes for a very interesting excursion, and a walk around the Great Pit and a visit to the Mining Museum are definitely recommended. The major activity, however, is a visit to the mine itself. It's a rather cold and wet affair, and you will get a helmet and raincoat, but it's still a great experience to see how the miners actually worked down there. The mining complex is about a 25-minute walk from the city centre, which is a pleasant complement to the industrial part and also contains several components of the WHS, including St. Christine's Church, the large main square, and the Stora Kopparberg Church. The WHS also includes many mining sites outside of Falun (more like a cultural landscape), but the most important sites are in the city itself. Falun is on a direct train line from Stockholm, and should be included in any visit to Sweden. The big hole of the Falun Gruva was no different from that of other open cut copper mines I have visited in New Zealand and Papua New Guinea. It is the red painted wooden mine buildings that make it different, together with the similarly constructed houses of the Elsburg district. The elegance of the mine headquarters and other civic buildings demonstrate the wealth that the mine brought to the town. Similar to Engelsberg, The Great Copper Mountain in Falun is a living witness to the mining history of Sweden, an industry that together with the forest industry formed the backbone of the Swedish rise to power in the late 16th century. The copper mine in Falun produced the shining red metal for cathedrals and palaces across Europe as well as coloured all wooden houses in the dark red “Falu Rödfärg”, the cheapest and best paint available for centuries in Sweden. 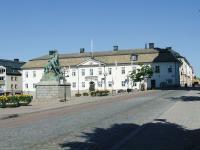 History also tells that during the 17th century, Falun accounted for 70% of all the copper produced in the world. Mining is thought to have started as early as the 8th century but industrial production got moving first during the Middle Ages. Mining in Falun ceased in 1992. The mine turned from an underground activity to a large open pit when it the whole mine collapsed in the late 18th century and created the 95 meter deep and 350 metres wide pit that you see today. Mining has of course continued deeper and deeper, reaching as far as 900 meters underground. You can visit the mine on guided tours but you never go deeper than 55 meters, which is the oldest and most interesting part anyway. Close to the mine is the town of Falun, with its decorative, dark red wooden houses that was seen all across Sweden in the hey-days of the mine. In the more modern centre you find traces of the mining industry almost everywhere, for example the pompous mining office. It takes about 3 and a half hour to get to Falun from Stockholm by train and from the station to the entrance of the mine there is a 20 minute walk, making The Great Copper Mine of Falun a perfect Sunday excursion, exploring one of the cornerstones of the Swedish industrial heritage. Also - don’t forget to try the Falu Sausage (Falukorv) - just as famous as the mine itself and the red paint!